Victory is mine!!! I finished off my Weekender bag yesterday afternoon/evening, and I couldn't be happier about it. I love how it turned out, although there were definitely plenty of bumps along the way. I will probably never ever make another Weekender, but I'm really proud to have finished this bag. Adding the zipper wasn't as bad as I thought it would be. Once I sat down and truly read the directions, without a three-year-old tugging on me or asking me his thousandth question of the day, it made perfect sense. During evil step #11, I seriously considered giving up a few times, but Megan saved the day when she texted me a handy dandy tip - use clothespins instead of pins or binder clips. That worked infinitely better while trying to sew through multiple layers of Peltex, and I was able to keep going through to the finish line. Rather than slipstiching the lining by hand, I chose to basically topstitch the lining top panel to the exterior top panel, which worked beautifully for me. 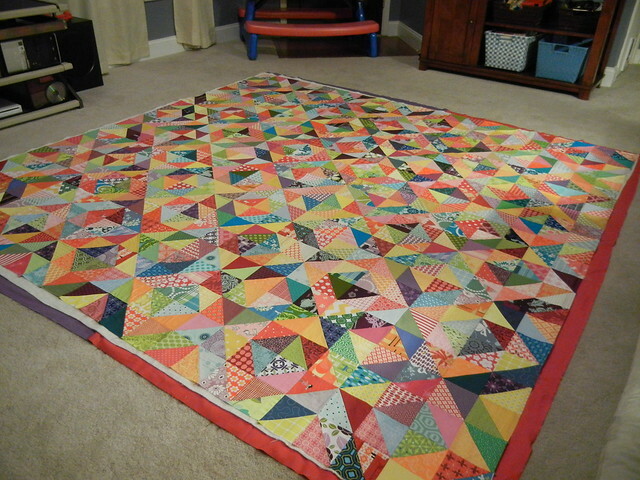 I feel like this will be much sturdier in the long run, given that I feel my hand-stitching skills are pretty weak. 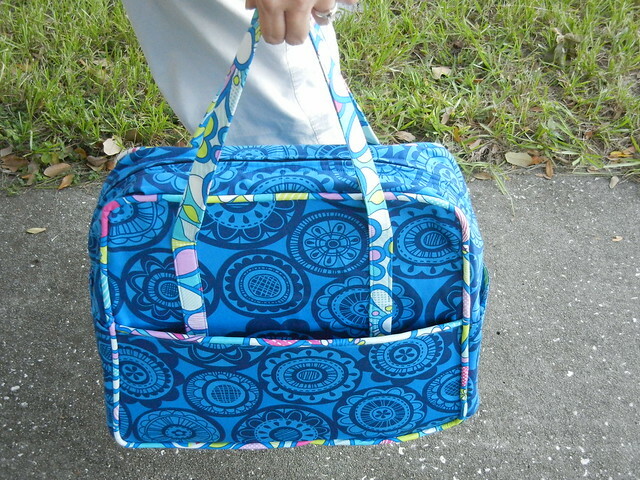 This bag is all ready and set to go to the Sewing Summit now! 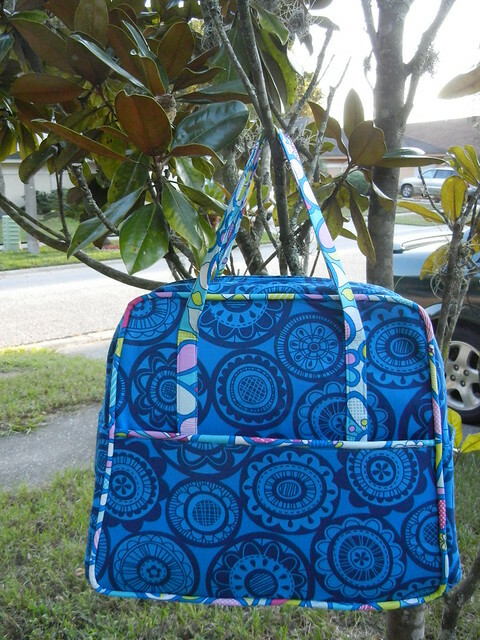 Only problem is, now I'm thinking about making a handy-dandy laptop case to go with it! I'm linking up with Sew Modern Monday today, hop on over to find more modern finishes! Fortunately, I caught this mistake before the piping went on top, and as I texted back and forth with Michelle over my serious error, I realized that I could fix it pretty quickly, so thankfully, I got back on track pretty quickly, and without much tears or cursing, believe it or not. The biggest, most important thing about this pattern is to read the instructions and to read them carefully. If I could have managed to do that, I would have avoided the biggest whoops I made. The piping wound up being a lot easier than I anticipated, though I wish the pattern had better described where to stitch on the piping. I definitely sewed a bit too close to the cording, but it's okay, I'll make it work - the thread matches pretty well, so for my first attempt at cording, I'm pretty happy. I've added the handles and the front pocket so far and the piping to one of the main panels, so it's starting to look a bit like a bag now. I'm up to step 7, and I'll have to stay there for now, as step 8 calls for the special-order zipper I haven't yet received for this bag, so I'll have to set my bag aside for now. Really, my only feedback for those of you thinking about tackling this pattern is to be careful with cutting the interfacing - the measurements from the pattern are really to the inch - and to take each step slowly. Don't jump ahead, and be patient. Patience doesn't come naturally to me when I sew, so it's been a big-time challenge, and I'm impressed that I've only had to pull out my seam ripper once. Stay tuned for round 3 when my zipper arrived, which will hopefully be by next weekend! First, thank you all so much for your well wishes about my munchkin's first day of school. He's been to school twice this week, and has loved every minute of it so far. While I miss the heck out of him while he's there, I've really enjoyed the little bit of free time it's allotted me and I've loved seeing the big grin on his face when I come to pick him up at school. 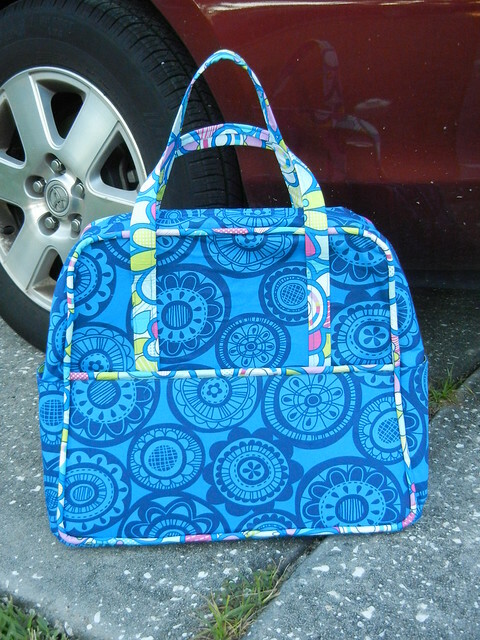 One of the things I've started working on is the infamous Amy Butler Weekender bag. 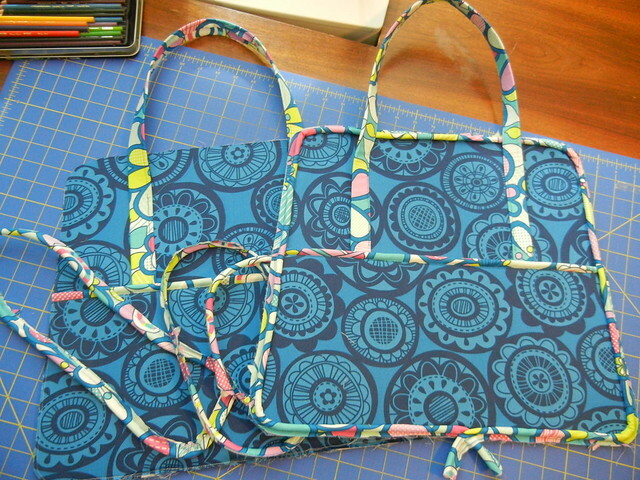 Much has been written about this bag, and how maddening it can be to make, yet, I still wanted to make one. I picked some fabulous fabrics from Erin McMorris's Summersault collection, and I can see the finished bag in my head...but I suspect getting there is going to be challenging, to say the least. 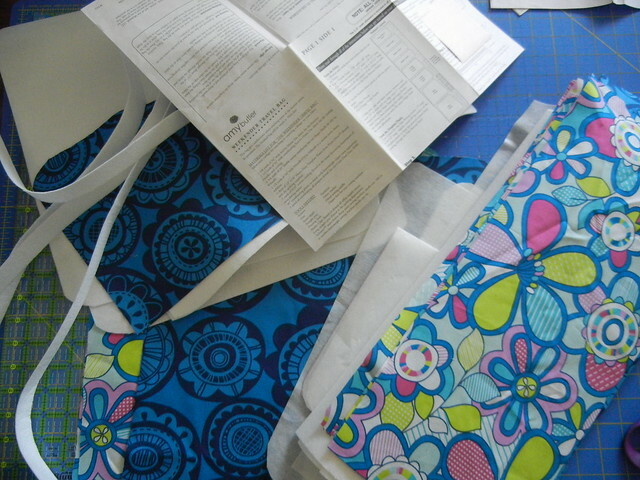 There are 13 steps to making this bag, and I've gotten through the first two so far, which is a boatload of cutting. There's two kinds of interfacing used for this bag - Peltex 70 (the stiffest kind of Pellon interfacing) and a lightweight interfacing, like ShapeFlex. 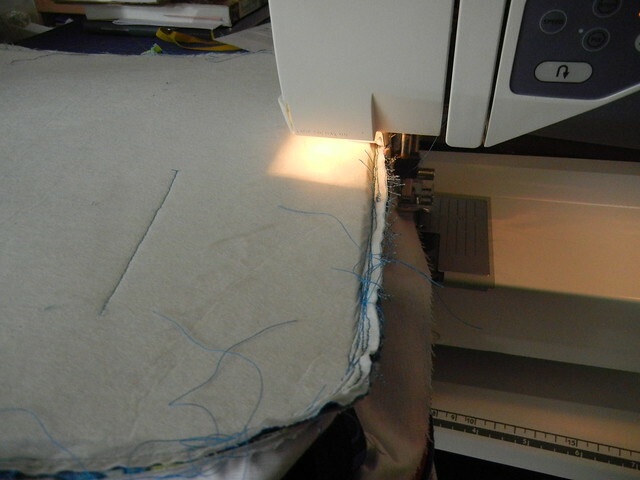 Officially, there are 22 pieces cut from the lining and exterior fabrics, and 23 pieces cut from the two interfacings. It was tedious, to say the least, but I made it through. It's the next step that's got me freaked out. 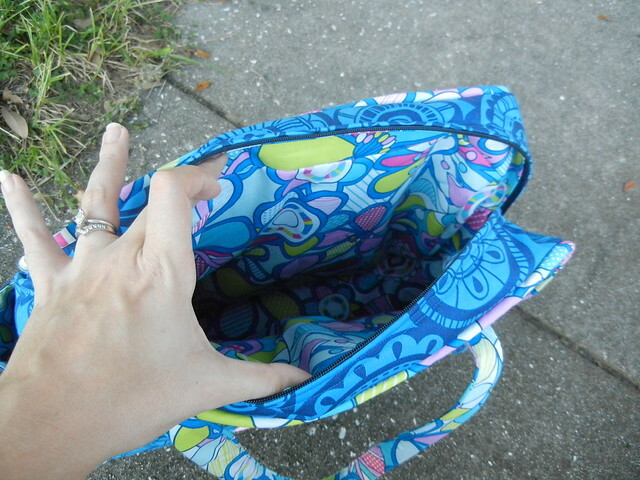 Step 3 is where I get to make my own piping to go with the bag. I cut a bazillion bias strips to create the piping with, and I've got the cording, but I am not looking forward to this step. Why? Because I've never done it before, and it doesn't sound like fun. But, I'm going to do it, and hopefully it will be easier than it seems. I've read the step three times this morning, I'm as ready as I'm ever going to be.